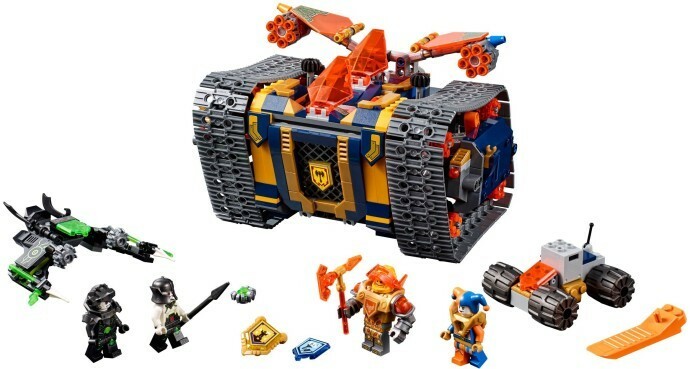 Get ready for a heavy-duty LEGO® NEXO KNIGHTS™ battle with Axl's Rolling Arsenal, featuring hidden flick missiles and opening drawbridge. Pitch the Jestroyer with its dual 6-stud rapid shooters against the Vyro Glyder. Lock up the critters in the Critter Trapper's storage chest and save Knighton from the tech infection. This popular kids toy includes 4 minifigures and 3 scannable shields. 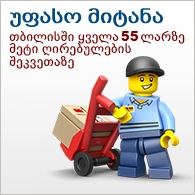 Includes 4 minifigures: Axl, Jestro, VanByter No. 407 and a MegaByter. 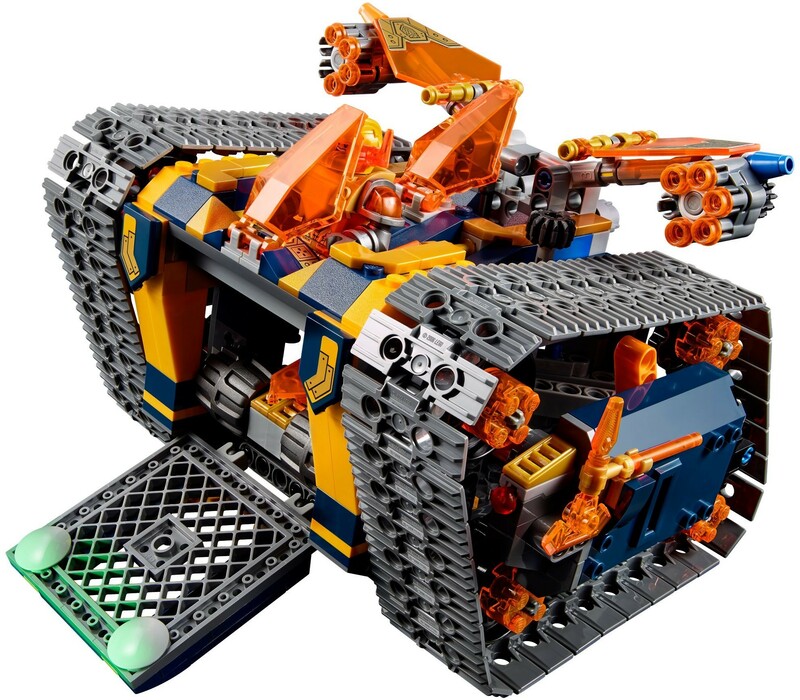 Axl's Rolling Arsenal features a lowering drawbridge, minifigure cockpit, 2 flick missiles and a shield holder, plus the Critter Trapper mini-tank with a storage chest and shield holder. Jestroyer features a minifigure cockpit, 2 movable wings mounted with 6-stud rapid shooters and 2 detachable daggers. Vyro Glyder features a minifigure cockpit, dual critter shooters, 2 detachable sabers and a shield holder. Flip out the tank’s dual flick missiles and push the lever to shoot! Activate the drawbridge function to release the Critter Trapper. Weapons include Axl’s axe and the MegaByter’s spear. 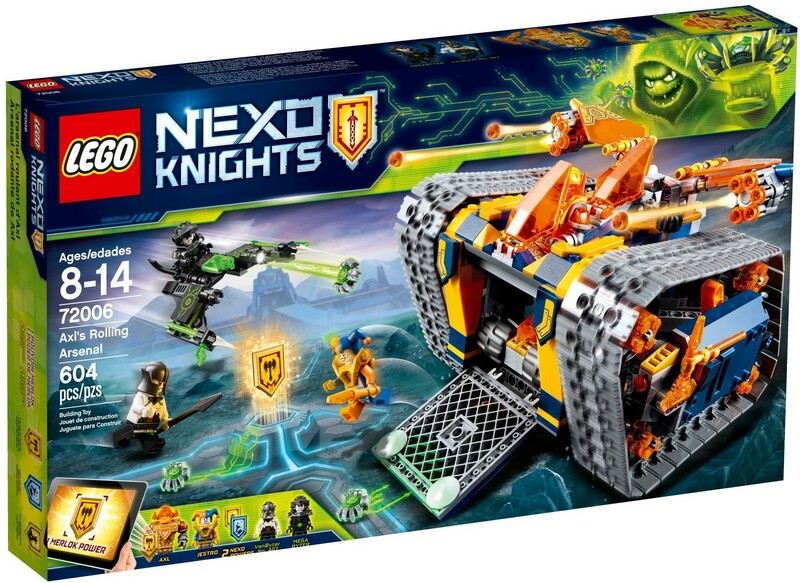 Scan shields for the NEXO Powers Drop the Beat and Standing Ovation, and Merlok Power The Axe of Merlok, and power up in the LEGO® NEXO KNIGHTS™ game! Axl's Rolling Arsenal measures over 5” (13cm) high, 5” (15cm) long and 8” (22cm) wide, and over 9” (23cm) wide and 7” (19cm) long in attack mode. Jestroyer measures over 2” (7cm) high, 3” (10cm) long and 6” (16cm) wide. Critter Trapper measures over 1” (4cm) high, 2” (7cm) long and 2” (6cm) wide. Vyro Glyder measures over 1” (4cm) high, 4” (11cm) long and 3” (9cm) wide.